Eternal youth may still be a distant dream. 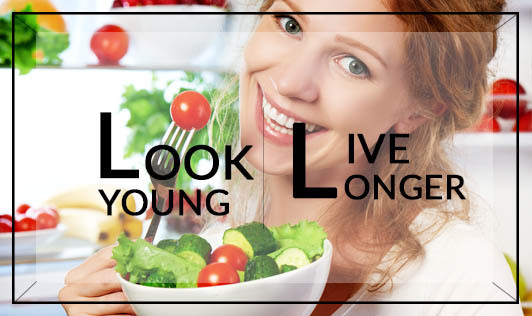 but looking younger can definitely help you live longer. B Vitamins: Found in whole grains, meat, eggs and nuts. They nourish the digestive system, reduce musculoskeletal pain, keep the skin and hair healthy and help in making red blood cells. Broccoli: It has anti-cancer properties and is high in folic acid, iron, vitamin C, zinc and beta carotene. Enhances mood and keeps us youthful by boosting immunity. Tomato: Contains vitamin C, potassium and fibre. But what makes it special is the presence of the anti-oxidant pigment called lycopene, which can prevent prostate cancer. Yoghurt: The best form of calcium we can get. Tofu: What the Okinawa people have, particularly in miso soup. Orange, yellow vegetables and fruits: Rich in anti-oxidants and beta carotene that gets converted to vitamin A in our bodies. Essential for good hair and eyes. Red and yellow peppers, carrots, papaya, mangoes, apricots... the list is long and tasty. Good oils: Plump up your skin with heart-healthy oils from nuts, seeds, oily fish and olive oil. Lower bad cholesterol, raise good cholesterol, prevent blood clotting-the main cause for strokes and blockages.